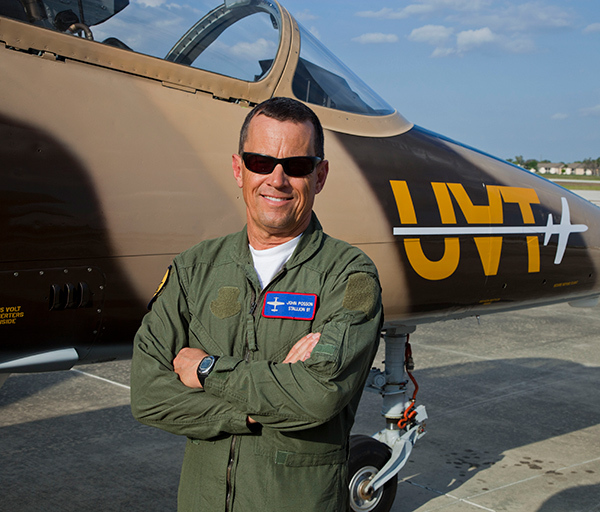 John Posson is a P-51 and L-39 instructor for Stallion 51 Corporation. For 16 years during the summer air show season, he’s flown an L-39 on the left wing in the diamond formation for The Patriots Jet Team. His 25 years of commercial flying includes a season as a bush pilot, three years with Wien Air Alaska, six years with Hawaiian Airlines and 15 years with United Airlines. Throughout his career, John has accumulated over 21,000 hours of flight time, including 1,700 hours in the Mustang. John’s vintage aircraft experience includes DC-3s, Beech 18s, Howards, Norsemans, Grumman Widgeons and a mix of others, from Cubs to Mustangs. John is a commercial-instrument-rated helicopter pilot as well. He has a strong sport aviation background that includes over 2,300 parachute jumps, over 100 hours in hang gliders and competition aerobatics through the unlimited category. He is currently the part owner of a Bonanza, a Super Cub and a Cessna 180, and he is a friend of dogs.